Darwinists went even further and depictefd the fictitious entity they named Nebraska Man, on the basis of a single pig tooth, together with his family. 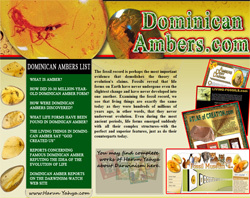 The subject of human evolution is of vital importance to Darwinists. The idea they have tried for years to indoctrinate people with is the lie that man is a supposed evolved animal. They strive with all their power to maintain this lie, and attempt to insert the idea that human beings have supposed animal ancestors in even the most unrelated subjects. The deceptions to which they resort on this matter are breathtaking. 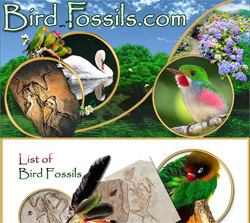 Even totally unconnected fossil find is presented in such a way as to suggest they are human beings. So much so that Darwinists produced Nebraska Man from a single fossil tooth, which would later be proven to belong to a wild pig, and they had no qualms about depicting this entity's entire social life together with its family and community. One of the most significant examples of these astonishing endeavors is their long-time claim that Australopithecus is the so-called ape-like ancestor of man. Australopithecus is an extinct species of ape. 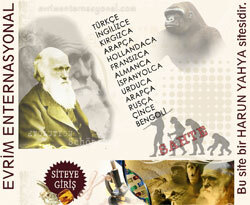 The name means "Southern ape," and Darwinists seek to depict it as the first ape-like ancestor of human beings. As with all other examples, since this species of ape is extinct, evolutionists have used it as a tool for speculation. But as with all other examples, the scenarios that Darwinists produce regarding Australopithecus are again based on deception. Australopithecus is thought to have first appeared in Africa fourmillion years ago and to have survived until one million years ago. The fact that needs to be made absolutely clarified here is that all Australopithecines are extinct apes resembling their modern-day counterparts. They all have brain volumes the same as, or smaller than those of present-day chimpanzees. They walked on four feet. Like present-day apes they had bony protrusions that helped them to climb trees, and their feet were prehensile to allow them to cling onto branches. They were short in stature (maximum 130 centimeters) and, just like present-day apes, the male Australopithecus was much larger than the female. Hundreds of details in their skulls, and features such as their close-set eyes, their sharp molars, their jaw structure and their long arms and short legs are all evidence showing they were no different to present-day apes. The similarity between Australopithecus and chimpanzee skulls indicates that Australopithecus is a genuine species of ape, rather than an ancestor of man. Although the Australopithecines were all evidently species of ape, Darwinists describe them as life forms that managed to walk on two legs. This is a blatant deception, because not a single one of the Australopithecus-related fossils unearthed to date corroborates this scenario. The evolutionary scenario for these entities is thus based on no scientific evidence. The Darwinist Science et Vie magazine used the caption "Adieu Lucy" (Farewell Lucy) in an admission that Australopithecene apes could not have been the ancestors of man. In summary, scientific research has refuted all the claims suggesting that Australopithecines were the forerunners of human beings. They were all species of apes, and to equate them with human beings is a scenario utilized by Darwinists for the sake of their fictitious and false theories. For years, Neanderthals were depicted in false illustrations as supposed primitive ape-men. But science has shown that the Neanderthals are an extinct human race, and essentially no different to people living today. Darwinists employed the same technique they used with Australopithecus for the Neanderthals, an extinct human race. Neanderthal Man entered the scientific literature with the discovery in 1856 of fossils in the Neander Valley near the German city of Düsseldorf. The curvatures in its skull and bones led it to being regarded by evolutionists as a supposed primitive human species. In 1908, an almost complete skeleton described as belonging to Neanderthal Man was found in the French region of La Chapelle-aux-Saints. The bones were re-assembled by the famous paleontologist and geologist of the time, Marcellin Boule. The Neanderthal Man that emerged from this re-assembly had a stooped posture and a protruding skull. Its legs were also locked at the joints, meaning it lacked a fully upright posture. Through this appearance, the impression was formed in the minds of the people that Neanderthal Man was a primitive being. Neanderthals were also depicted as ape-men in fictitious illustrations. This false impression of the Neanderthals lasted for 100 years. But analysis of the La Chapelle skeleton in the 1950s determined that the Neanderthal to whom it belonged had a kind of joint infection. Healthy individuals were in fact able to walk just like normal human beings. In 1985, the same skeleton was examined by the anthropologist Erik Trinkhaus. That examination confirmed that Neanderthals walked upright and revealed another fact that had hitherto remained hidden: Marcellin Boule had deliberately portrayed Neanderthal as being stooped.74 The joint disorder identified in the 1950s was no obstacle to the individual walking upright. It appeared that the Darwinist Boule was unwilling to admit that the Neanderthal walked like a normal human being. 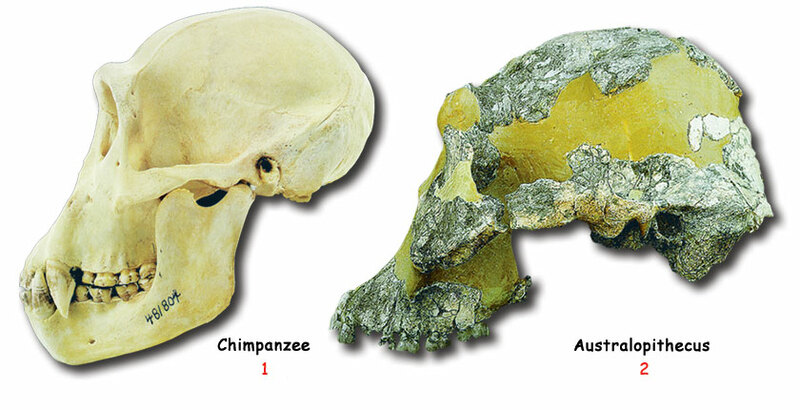 Meanwhile, the size of the Neanderthal skull also forced evolutionists into inconsistency. The reason was that Neanderthals had a skull volume of around 1700 cc; this is 200 cc more than the volume of today's human beings. The fact that Neanderthals, supposedly a "primitive" species, had a greater brain volume than Homo sapiens represented a huge contradiction for the theory of evolution. There is no doubt that because the Neanderthals were a human race they possessed the same features as modern races. Neanderthal Man was a talented maker of tools and a skilled hunter. He even engaged in music and art. They had a cultural and social structure, just like societies today, and had religious beliefs.77 The civilization established by the Neanderthals was therefore no different to present-day civilizations. Above, The Homo sapiens neanderthalensis Amud 1 skull found in Israel. The individual is estimated to have been 1.80 m tall. The cranial capacity is the largest found to date: 1740 ccs. This fossil therefore explicitly refutes the claims to the effect that the Neanderthals were a primitive species. The Kebara 2 (Moshe) fossil to the side is the best preserved Neanderthal remains to date. It is impossible to distinguish the skeletal structure of this 1.70 meter tall fossil from that of modern man It appears from the remains of tools discovered together with the fossil that the society to which this individual belonged shared the same culture as contemporary Homo sapiens communities. 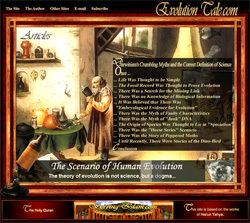 For years, Darwinists depicted the Neanderthals as ape-like ancestors of man. Yet these tools from the time show that the Neanderthals had the same conception of art and beauty as modern man. Neanderthals are simply an extinct race of human beings. The only rason for these efforts to use them as evidence for evolution is that they are extinct. The Neanderthals, proposed as a so-called ape-like ancestor of man, are therefore actually an extinct human race. In the same way that modern-day humans possess different features unique to their own races, so the Neanderthals also had their own unique characteristics. Therefore, it is a huge deception to use them as evidence for evolution. Indeed, the Neanderthal fossil was removed from the scientific literature in 1978. But the Neanderthals still appear in Darwinist references as if they represent some great evidence of evolution. 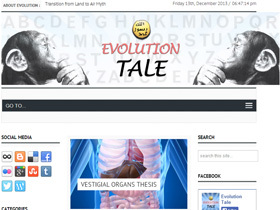 The aim behind the speculation about Neanderthal Man that is still going on in some evolutionist publications is to influence and mislead people who are ignorant of the true facts about the Neanderthals, and who are unaware that they were a "transitional form" that has been scientifically discredited. It is therefore of the greatest importance to highlight the true facts about Australopithecus and the Neanderthals, and to put an end to this Darwinist deception. 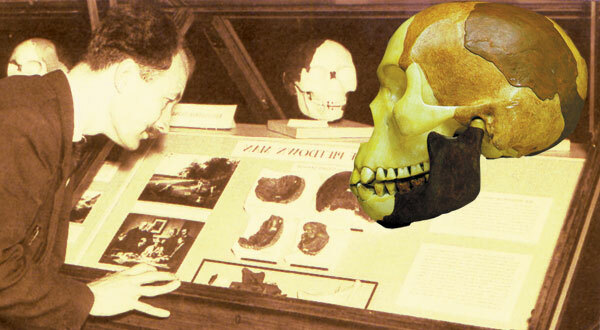 But Piltdown Man was a huge fraud, a deliberately manufactured hoax. In 1949, Kenneth Oakley from the British Museum Paleontology Department sought permission to use the newly developed "fluoride test" on a number of ancient fossils. The Piltdown Man fossil was duly tested using the technique. The test revealed that there was no fluoride in the Piltdown Man jaw bone. This meant that the jaw bone had been underground for no more than a few years. The skull itself contained a small amount of fluoride and must have been a few thousand years old. The Piltdown Man is an infamous hoax, assembled by adding a human skull to the jaw of a recently deceased orangutan. This hoax fossil was displayed for some 40 years in the British Museum as proof of the supposed evolution of man. When the fraud was exposed, in 1949, it was hurriedly removed from both the museum and the scientific literature. However, this fossil has been immortalized in the history books as a source of enormous shame for Darwinists. In 1922, American Museum of Natural History director Henry Fairfield Osborn announced that he had discovered a Pliocene molar tooth fossil near Snake Valley in West Nebraska. This tooth, it was claimed, bore common ape and human features. Before long, a profound scientific debate had commenced on the subject. Some interpreted this tooth as coming from Pithecanthropus erectus while others said it was more human. This fossil that created such major debates was given the name "Nebraska Man." A "scientific" name followed immediately after: Hesperopithecus haroldcooki. Reconstructions of Nebraska Man's skull and body were produced on the basis of this single tooth. Things went even further as pictures showing Nebraska Man's family in their natural habitat were published. All these scenarios were produced from just one tooth. Evolutionist circles adopted this "ghost man" so strongly that when a researcher called William Bryan opposed such definitive pronouncements being made on the basis of a single molar, he attracted enormous wrath. Darwinists produced false pictures of Nebraska Man together with his family, all on the basis of a single pig tooth, and published these in text books. For many years, they had no compunction about deceiving students and other people. In 1922, A TOOTH WAS DISCOVERED IN NEBRASKA. With a little imagination the tooth was connected to a mythological jawbone, the jawbone was connected to a skull, the skull was connected to a skeleton, and the skeleton was given a face, features, and fur. By the time the story hit a London newspaper, not only was there a picture of "Nebraska Man" but there was also a picture of "Nebraska Mom." All of that from a single, solitary tooth. Imagine what might have happened if a skeleton had been discovered. Perhaps a yearbook would have been published! As a consequence, all pictures of Hesperopithecus haroldcooki and its "family" were hastily removed from the literature. Nebraska Man is an important indication of how Darwinists can produce an utterly fantastic scenario of evolution on the basis of a single tooth. Although a tooth provides no information about a living thing's general anatomy, the way that the drawings of Nebraska Man and his family were produced on the basis of a pig's tooth, and the fact that this was portrayed as scientific until the truth was revealed, is a huge logical deficiency and an utter humiliation for Darwinism. 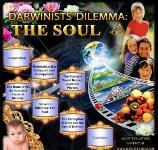 But Darwinists have refused to abandon frauds, and are consciously continuing with their Darwinist deceptions. Tree bark in the mid-19th Century during the early part of the Industrial Revolution in Great Britain was light in color. For that reason, dark colored variants of the moth species (melanic moths) Biston betularia could easily be seen and caught by birds. Fifty years later, however, lichens, a kind of algae, had died out around the trees as a result of industrial pollution, and the trees had become darker in color. At this time, it was now the lighter colored moths that were more visible on the trees and that were caught more often by birds. As a result, the number of light colored moths declined, while the darker melanic moths increased in number, since these were less easily caught. Evolutionists eagerly seized on this state of affairs as significant evidence for their claims of evolution by way of natural selection. Using the same deceptive techniques, as always, they then set about trying to mislead people into thinking that light-colored moths evolved into darker ones. This claim was heralded with the so-called phrase "evolution in action." But the facts were very different, since these moths in fact underwent no evolutionary change at all, the only thing present being a huge Darwinist deception. In 1953, H.B.D. Kettlewell, a Darwinist doctor of medicine and also an amateur biologist, decided to perform an experiment to observe the phenomenon. He carried out experiments and observations in rural parts of England where these moths were living. As a result of his experiments, Kettlewell determined that dark moths on lighter lichen were caught in larger numbers. He then announced this in an article titled "Darwin's Missing Evidence" in Scientific American magazine, as if this were a giant discovery in the name of Darwinism. By 1960, Kettlewell's account had assumed its place in all school text books. A result of industrial pollution the lichens, a kind of moss, covering tree trunks die and the trunk turn black. Since light-colored moths are more visible on these trunks they are more often eaten by birds. Therefore, as the number of light-colored moths declines, the numbers of dark-colored ones rises, as they are eaten less frequently. But there being large numbers of one kind of moth is most definitely not evolution; yet Darwinists use this to mislead people and try to depict it as supposed evidence for evolution. Holdrege had for a long time been showing his students photographs of moths placed on tree trunks and describing how birds would locate and catch the more visible ones. But now someone who had researched these moths for 25 years was saying he had only seen moths on the tree trunks twice. A fierce scientific debate erupted almost immediately. The debate led to the following conclusions: many studies performed after Kettlewell's experiments showed that the moths landed on only one kind of tree trunk, preferring the undersides of horizontal branches of all other kinds of tree. Since the 1980s, everyone has been in agreement that moths land only very, very rarely on tree trunks. Many scientists, such as Cyril Clarke and Rory Howlett, who conducted a 25-year study on the subject, as well as Michael Majerus, Tony Liebert and Paul Brakefield have declared that "Kettlewell obliged the moths to behave in an unnatural manner in his experiments, for which reason the results of the experiment are scientifically unacceptable." Researchers investigating Kettlewell's experiment encountered an even more astonishing finding; while there should have been more light-colored moths in unpolluted regions of England there were actually four times as many dark ones. In other words, contrary to what Kettlewell claimed, and what had been reiterated in every evolutionist reference book, there was no correlation between tree bark and the ratios in the moth population. 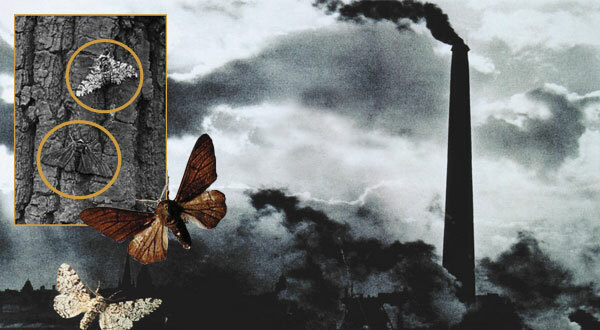 With the revelation of all these facts, people realized that the tale of the Industrial revolution moths, depicted as "Darwin's missing evidence," was in fact a giant deception. For decades hundreds of millions of people had been deceived by photographs of a few dead moths glued onto a tree and a hoary old tale concerning them. The real truth of the matter is this: the evidence that Darwin needed does not exist and it is impossible for it ever to be found. Because living things did not evolve. The interesting thing is that the Industrial Revolution moths are still presented in some text books as evidence of evolution. In this way, Darwinists aim to mislead impressionable young minds that are unaware of this fraud. Depicting a fraud as genuine evidence, even though this fraud has already been exposed, is in fact evidence of Darwinism's despair, lack of proof and purely ideological nature. The fact of Creation is clear to see. Darwinists trying to avoid this clear fact imagine they can find a solution by resorting to lies and trickery. 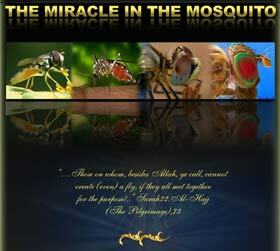 But Allah will certainly do away with trickery and falsehood and superstitious religions. 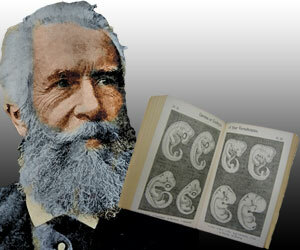 Ernst Haeckel and his false embryo drawings. In his 1868 book Natürliche Schöpfungsgeschichte (The History of Natural Creation) Ernst Haeckel suggested that he had made various comparisons using human, monkey and dog embryos. The drawings he produced consisted of nearly identical embryos. On the basis of these drawings, Haeckel then suggested that the life forms involved had common origins. But the true state of affairs was very different. Haeckel had produced a drawing of just a single embryo, and then produced human, monkey and dog embryos from this by making very small changes. In other words, it was a hoax. But according to Darwinists, in order to keep the dogma of Darwinism propped up, there was a need to declare that one of the false pieces of evidence in their possession was actually "proof of evolution." The fraud perpetrated, or other Darwinists being aware of it, was unimportant for them; what mattered in their eyes was for it to be heralded as evidence of evolution, even if it was fraudulent. That is the reason why, despite the exposure of the fraud, Darwin and the biologists who supported him continued to regard Haeckel's drawings as a reference source. And that further encouraged Haeckel. In the years that followed he produced further series of comparative embryo illustrations. 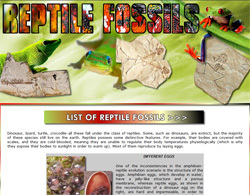 He prepared diagrams showing fish, salamander, turtle, chicken, rabbit and human embryos side by side. The noteworthy aspect of these was how the embryos of these different life forms initially resembled one another very closely and gradually diverged over the course of their development. The similarity between the human and fish embryos in particular was very striking indeed. So much so that fictitious "gills" could be seen in the human embryo drawings, just as in those of the fish. Under the scientific guise he gave these illustrations, Haeckel launched his "theory of recapitulation": Ontology Repeats Phylogeny. The meaning of the slogan was this; according to Haeckel, during the developmental process it undergoes in the egg or the mother's womb, every living thing repeats the supposed "evolutionary history" of its species, right from the very beginning. According to this false theory, the human embryo in the mother's womb first resembles a fish and then, in subsequent weeks, a salamander, a reptile and a mammal, finally "evolving" into a human being. But this was a huge fraud. In the 1990s the British embryologist Michael Richardson examined vertebrate embryos under the microscope and determined no resemblance to Haeckel's drawings. Following their study, Richardson and his team published genuine photographs of embryos in the August 1997 issue of the journal Anatomy and Embryology. It appeared that Haeckel had taken various template designs and distorted them in various ways so that the embryos would resemble one another. He added imaginary organs to embryos, removed organs from others, and depicted embryos of very different sizes as being the same in scale. The clefts that Haeckel depicted as "gills" in the human embryo had in fact nothing to do with gills at all. They were actually the middle ear canal and the beginnings of the parathyroid and thymus glands. The embryos did not in fact resemble one another whatsoever . Haeckel had made innumerable distortions in his illustrations. The modern-day biology book to the left engages in false evolutionary propaganda by using Haeckel's fake drawings. This is important evidence of how broadly and shamelessly the Darwinist deception is perpetrated. Although Darwinists were delighted in the short term that a lie planned by the dajjal was put forward as false evidence for a heretical theory and had such an impact, it in fact heralded terrible disappointment for them. Through Haeckel's drawings, people saw the scale of the deception to which a senior scientist would resort to in the name of Darwinism. It was thus once again proved how Darwinism was in constant need of a "lie." People clearly saw how evolutionists could turn a blind eye to fraud. Haeckel's fraud was another significant piece of evidence of the destruction of the theory of evolution and the system of the dajjal. This fraud may have been met with silence in the 20th Century, but the 21st Century has seen this and similar frauds exposed, and the genuine scientific evidence put on display. The more these frauds have been exposed, and the more genuine scientific evidence produced, the more the collapse of Darwinism has become ever more apparent. In 1879, two well-known evolutionists of the time went even further in their activities intended to constitute evidence for the fictitious evolution of the horse scenario, and set up the equine series that Darwinists would maintain on the agenda for many years to come. The American fossil researcher Othniel Charles Marsh and Thomas Huxley (known as "Darwin's bulldog") established a supposed equine evolutionary series by setting out various hoofed fossils, based on the number of nails on the front and rear feet and the structure of their teeth. One small mammal fossil, previously named Hyracotherium by Sir Richard Owen in 1841, was renamed in such a way as to echo so-called evolution, being given the name Eohippus, meaning "Dawn Horse." The pair published their claims and diagrams in the American Journal of Science, thus laying the foundations for the horses' evolutionary sequence laid out from Eohippus to the present day in museums and text books as supposed evidence of evolution. The main stages in this fictitious series were Eohippus, Orohippus, Miohippus, Hipparion and the present-day Equus. 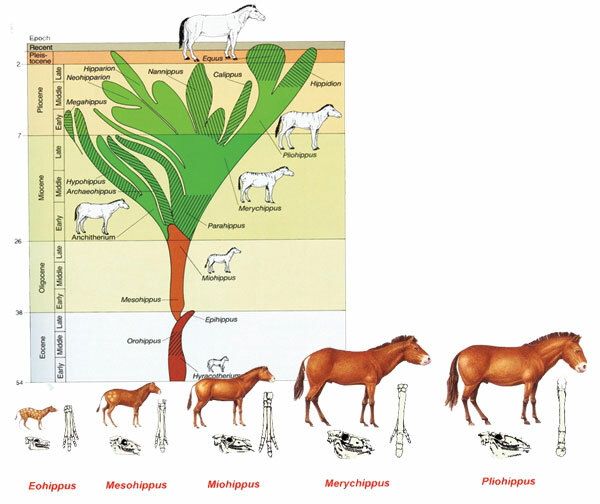 This fictitious sequence was portrayed as the greatest supposed evidence for the evolution of the horse for the following century. The decrease in the number of toes and the regular increase in size, from smaller to larger, was enough to convince evolutionists. Shortly afterwards, inconsistencies within the evolutionary sequence began manifesting themselves. New fossils were unearthed, and attempts to insert these into the false sequence presented a problem. 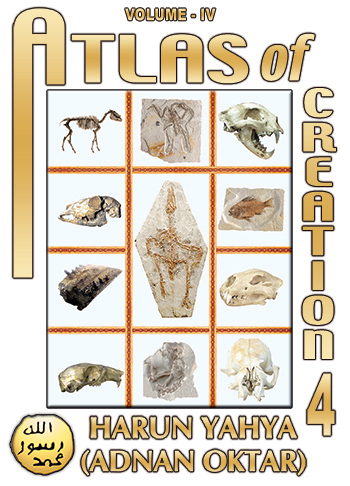 The trouble was that characteristics such as the fossils' location, age and toe number formed inconsistencies and impaired the series, which turned into an inconsistent and meaningless mass of fossils in the face of these new specimens. 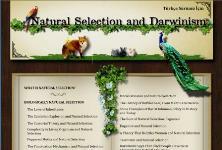 The Darwinist Eldredge's analysis is a most accurate one. Since deliberate distortions represent the essence of the system of the dajjal, those who espouse this system resort to deceptions too. 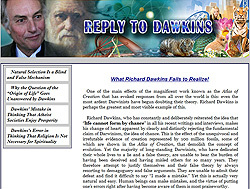 All the examples of Darwinist deception listed above have been exposed, and their false nature has even been admitted to by Darwinist scientists. These examples are sufficient to show the true face of the system of the dajjal. But it will still be useful to issue the following reminder: the Theory of Evolution, Darwinist ideology in other words, is built on a lie intended to deny the existence of Allah. 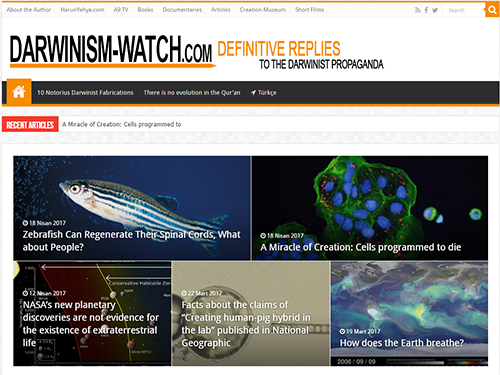 Therefore, all the claims, suggestions and evidence produced by Darwinism are false. All the statements to the effect that "proof of evidence has been discovered," "living things evolved," "or "human beings and chimpanzees are descended from a common ancestor" are lies. 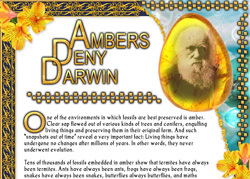 Darwinists espouse a lie. 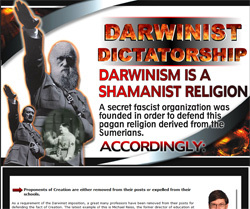 Their illogical obedience and devotion to the system of the dajjal is blind devotion to the religion of Darwinism, solely in order to be able to oppose belief in Allah. 74. Trinkhaus, Erik (1985) Pathology and the posture of the La Chappelle-aux-Saints Neanderthal. American Journal of Physical Anthropology Vol. 67 sf. 19-41. 76. Erik Trinkaus, "Hard Times Among the Neanderthals", Natural History, cilt 87, Aralık 1978, s. 10. 81. Kenneth Oakley, William Le Gros Clark & J. S, "Piltdown", Meydan Larousse, cilt 10, s. 133.